Any time I buy new clothes or sheets, the first thing I always do is wash them. Detergent, warm cycle, cool rinse. I do it because that’s just what you do, because factories are dirty, and what we buy travels a long way before it makes its way to us. Short of sanitary reasons, I never gave this little routine of mine much thought, until I got pregnant with my first child and decided, quite suddenly, I wanted to know exactly what I was washing out of my clothes and sheets every time I bought them. What I learned was that an industry responsible for clothing us and tucking us in at night was doing a lot more than just transporting and dying our fabrics. What goes into the materials that spend all of their time right up against our skin was, to be honest, pretty sketchy. That was when I decided enough was enough — organic sheets and clothes, from here on out. 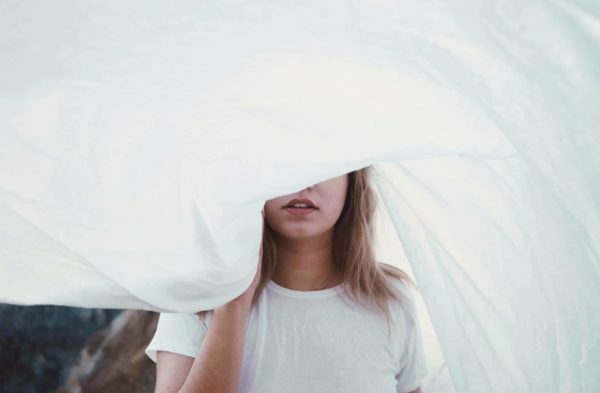 First things first, your sheets, your bedding, your clothes — just about any conventional fabric you come into contact with — is treated with flame retardant chemicals. There are federal manufacturing regulations that often require it, particularly since most fabrics these days are synthetic and particularly quick to burn. When I looked into flame retardant chemicals further, I learned that, while they had come a long way from the proven carcinogenic PBDEs of the 70s, these new chemicals were still linked to reproductive and respiratory disease, and were proven endocrine system disruptors. As I looked at crib sheets and onesies, the reality of that set in — these fabrics would be right up against my brand new baby’s face. When I had officially written polyester and nylon off, it occurred to me that natural fibers, at the very least, had to be better. They weren’t made of petroleum products, and they didn’t require as much, or sometimes any, flame retardants to be safe to use. What I didn’t realize at the time was that conventionally grown cotton consumes 24% of the world’s insecticides every year, and 11% of the world’s pesticides. Ironically, this fluffy, pure white plant was one of the dirtiest crops in the world. Cotton and other fibers go through a lot of processes before they wind up hanging on store racks, but were they being adequately rinsed of pesticides? In a world bent on reassuring us of their safety, I wasn’t so sure. All of this information lead me to one conclusion — I was about to start taking my new clothes routine a lot more seriously. The bottom line was, I’d rather take my chances with fire than flame retardants, and so I started stripping all of our sheets, clothes, and towels. There isn’t much scientific research out there to back up how to remove flame retardants and pesticides from clothes, but ultimately, my research seemed to point towards breaking down those chemical bonds with what was essentially an acid soak. I mixed up big buckets of vinegar and lemon juice to break down the chemical bonds between the flame retardants and the fibers. I don’t know how much it helped, but it gave me peace of mind to see that water change colors. For 48 hours, I soaked buckets of fabrics, then washed them thoroughly, hoping to make the best with what I had. It’s worth noting though that removing flame retardant chemicals from flammable materials is a catch-22. On the one hand, I felt better about snuggling up next to these fabrics, but on the other, I was trading chemicals for an increased flammability. Which was worse? I’m still not sure. I decided I didn’t want to have to keep making these choices. I decided, from here on out, my family would spend one third of their life in bed next to cotton sheets that weren’t grown with pesticides. They would sleep in pajamas that didn’t have to be saturated with chemicals to keep them from bursting into flames. And we would support clean, sustainable agriculture that didn’t endlessly consume our planet’s resources. I didn’t throw everything out and start from scratch. Even as I write this, I’m sitting in an ancient black polyester spandex tank top. Not being of celebrity wealth status, replacing my entire wardrobe and linens collection all at once just wasn’t in the cards, nor was it how I wanted to do this. What I did instead was start looking at alternatives, so that when it came time to replace those hole-y socks or those threadbare sheets, I could do so with materials I felt great about buying. Soft and breathable and made 100% without pesticides or insecticides, organic cotton is my go-to fabric for sheets and pillowcases, in addition to socks, underwear, and shirts. It’s easy to care for, and getting cheaper all the time. Wool is a natural insulator, which doesn’t just mean that it keeps you warm, but keeps excess heat out, too. Naturally antimicrobial, it’s worth the extra trouble to treat it delicately in the wash, and I LOVE it for duvets and shirts! Memory foam, move over, because your eco-friendly buddy is here, and he doesn’t stink. Natural latex is a natural thermal regulator, so it doesn’t make you sweat like a memory foam mattress does, it lasts longer, and it’s free of flame retardant nasties. If you like the floating-on-a-cloud effect of sleeping on a memory foam mattress, you need to try a latex mattress—you’ll never look back! This interesting little fiber feels like silk and cotton had a baby together. Soft and fine, it’s a great vegan alternative to down for pillows and duvets! I discovered buckwheat hulls when I met a girl who slept on a buckwheat hull mattress, and it blew my MIND. They feel like a beanbag when stuffed into a pillowcase, and are incredible because they’re non-toxic AND 100% biodegradable. I get a lot of funny looks from friends and family when I pass up crazy sales on sheets and baby clothes because of what they’re made of. And I get it, because in the end, we’re all just trying to keep our families clothed and our beds made, and what they’re actually made of is often the furthest thing from our minds. I’m not perfect. Sometimes I see an ugly Christmas sweater at Target, and I lose all resolve — retail instinct kicks in, and before I know it, I’m on my way home with a tinsel-covered abomination. But now that I know better, I try to do better. I only buy organic sheets. I’m really picky about the clothes I buy for my family. And when I shop, I look at more than just the price tag. I see the manufacturing plants that were responsible for producing what I’m putting in my cart, and I take pause, I think about what that purchase means a little more before I make it. If you’re ready to know what’s in your sheets and feel good about what you sleep on, check out White Lotus Home. Organic sheets, mattresses, and pillows for babies, kids, adults, and even futons, this store has it all!